Things are starting to green up and bloom here in Northern Indiana. 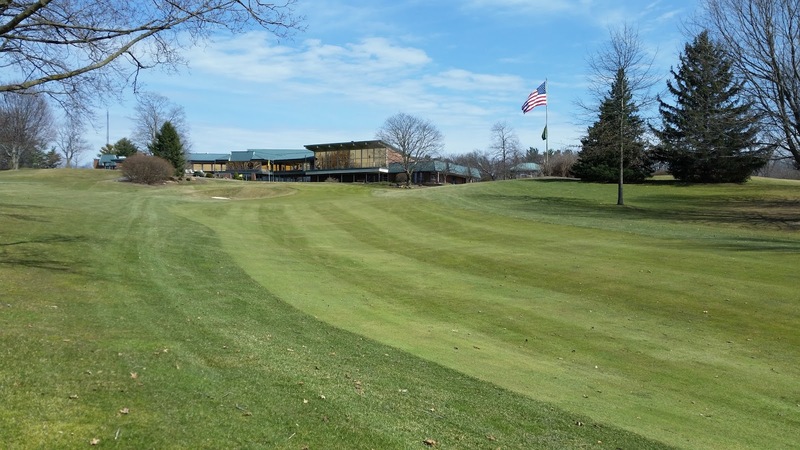 Forsythia have begun showing their yellow blossoms on the bottoms of the plants, daffodils and tulips withstood mid-March snows and freezes to begin their Spring, and the grass on the golf course is starting to green up in anticipation of another season. 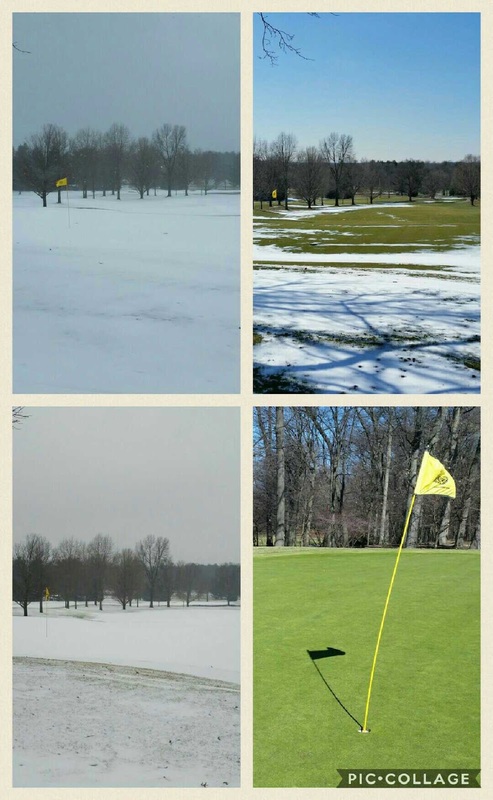 The picture to the right shows 9 green during a 96 hour synopsis of a typical March in Indiana. Snow, melt, snow, melt followed by a day where winds reached 60 miles/hour. The staff and I continue working on course clean up, applying pre-emergent treatments for crabgrass and other grassy weeds, and mowing the fine turf on an as needed basis. As weather more consistently warms and additional staff return, we will begin to assume our normal in-season maintenance routine. We are typically fully staffed by Memorial Day. As more of you come out to Elcona to enjoy the warmer weather, you will notice a couple of changes to your daily experience that we hope will enhance your enjoyment. One of these is a change in pin location options from 3 to 4. 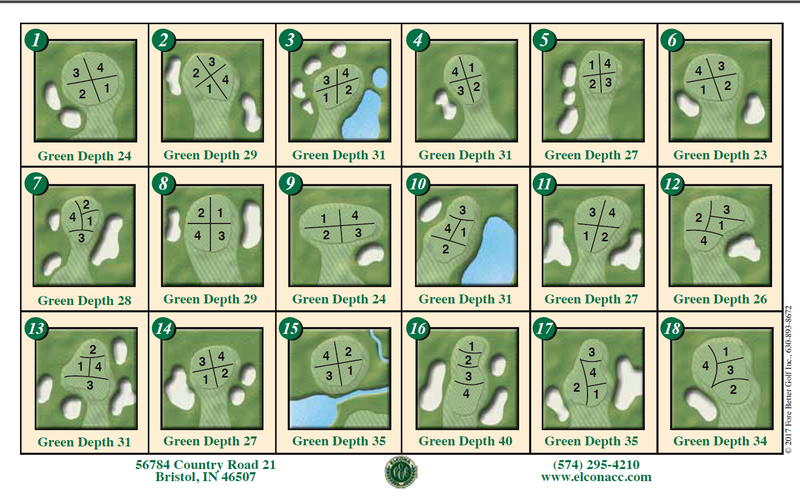 This will give our staff additional flexibility in both yardages on par 3’s (think 8 and 11) and moving pin locations better around wear points on the green. The other change is a new maintenance method we are trying in how we maintain the bunkers in an attempt to further improve the playability of them. A large focus of this centers around helping the ball better roll to the bottom of the bunker, to provide firmer sand and playing conditions in the bunkers, and to help prevent “fried egg” lies. 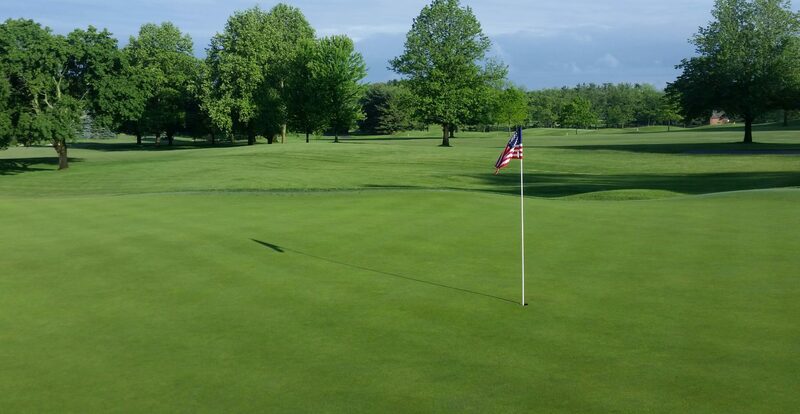 In the past, we raked the entire bunker and edges with leaf rakes in daily maintenance, a process that usually takes 5 staff members about 4 hours a day. The new style of raking is termed the “Aussie Method”, which began as a common method of maintenance in the Sandbelt region of Australia, and has become increasingly popular across the globe. It achieved global exposure during the 2014 US Open at Pinehurst. The idea behind this method is to compact the top edges and faces of the bunkers to better allow balls to roll down the slope after impact. The bottoms of the bunkers will be raked on the same schedule as before in season, and the edges will be smoothed and compacted completely 2-3 times per week with a soft roller. 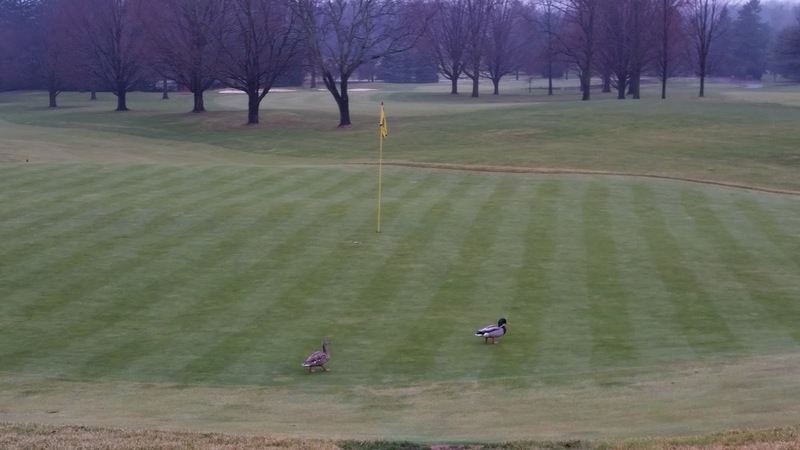 Other days, the edges will be checked and only the points of any edges affected by play, maintenance, or wildlife will be smoothed to maintain the look and compaction levels. I hope that over the course of the early season, this will help the playability of the bunkers while still contribute an aesthetically pleasing feature to the golf course. Bear with us as this will be a learning process for staff to find the most efficient way to utilize this style. However, please remember that the single most important factor regarding firmness in bunkers is moisture. 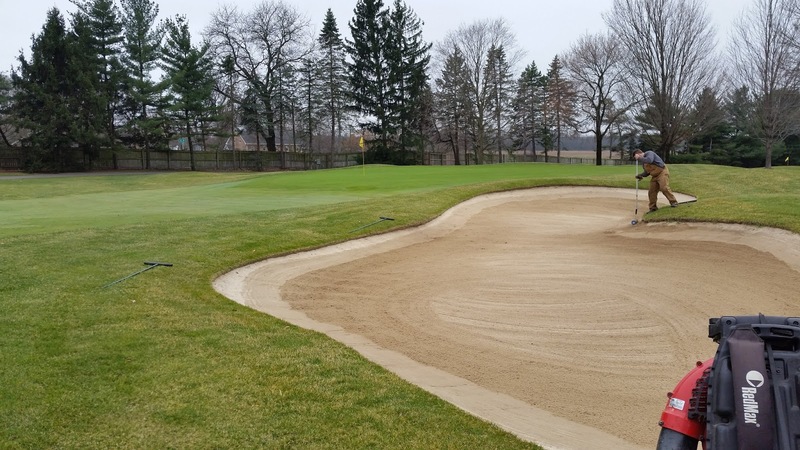 Wet bunkers will always be firmer than dry bunkers – regardless of maintenance practices. Also, during heavy rain events, many of our bunkers in their current position and shaping will have to be re-built and raked, which will return compaction levels to square one. The USGA has made a great video explaining bunker maintenance and consistency, which you can click here to view. Edging, pebble removal, and checking of sand depth levels will continue this month as more staff return. If you have any questions or feedback, please email me at ryan@eclonacc.com or call me at the Maintenance Facility. I hope to see you out on the golf course!